During the symposium “Scaling Up Evidence-based Nutrition Strategies: Using Modeling and Systems Thinking” at the American Society of Nutrition’s annual meeting, Nutrition 2018, on June 10th in Boston, SISN Board Member and Executive Director of Sackler Institute for Nutrition Science (SINS), Dr Gilles Bergeron gave an insightful presentation about the newly established Nutrition Modeling Consortium (NMC). The next day we invited interested individuals to join Dr. Bergeron for coffee and a rare opportunity to quiz him about modeling tools and how they might be utilized to inform the scale up of nutrition programs. 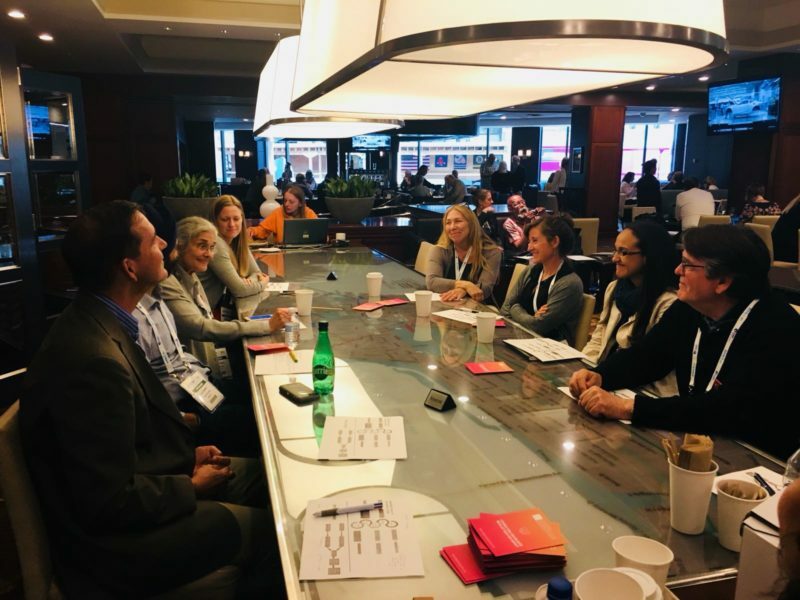 In this blog, Kassandra Harding, Associate Research Scientist at Yale School of Public Health, shares her experience and key learning from this SISN event. As an early-career implementation science (IS) researcher in nutrition with a love for data and models, I attended SISN’s scientific café during Nutrition 2018 because I was eager to discuss with and learn from the experience of Dr Bergeron and others in the field of nutrition relevant implementation research (IR). Over coffee, SISN president, Dr David Pelletier, and Dr Bergeron gave an overview of SISN, and highlighted the difference between IS and IS research, emphasizing that the later focuses on new, empirical work while the former draws on using what we already know about “sound management and implementation.” For those of us newer to the field, this distinction was well noted. 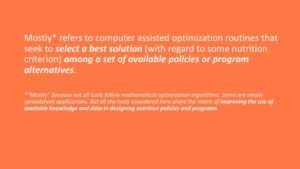 Dr. Bergeron then described how the application of nutrition modeling tools (Fig 1) can generate evidence to inform decision making and in turn shape nutrition policy. While numerous tools exist, each has different purposes, strengths and limitations. 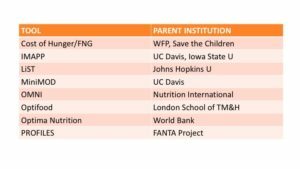 To date, their use has been somewhat ad hoc, therefore in 2017, SINS together with the Micronutrient Forum, convened a meeting to review the purpose of 8 nutrition modelling tools (Fig 2), identify how they were currently being used, and to start a dialogue around how to increase their uptake and utilization in the future. At the end of this two-day meeting, the group of 25 modelers, providers, donors and users agreed to continue these efforts through the establishment of the Nutrition Modeling Consortium (NMC). 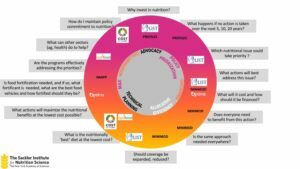 The NMC is a network for stakeholders interested in addressing key nutrition questions with a modeling approach and as such serves as a hub for information sharing and interaction between modeling teams and end users. One of the initial tasks of the NMC has been to conduct a three-dimensional mapping of the modeling tools across a policy and program implementation cycle, including which stakeholders or actors may be interested at various stages (Fig 3), and what key questions stakeholders may want to address (Fig 4). Of interest to me, was the presentation of the Consortium impact pathway (Fig 5) and the discussion around how the utilization of the tools could be evaluated by applying IR methods. Also of interest, was the discussion of how such a hub could become easily accessible to the end user, not just registering an interest in the tools and choosing the most appropriate tools, but also the implementation of the tools. We had a thoughtful discussion about the impact pathway leading to tool adoption and ultimately more effective policies and programs. From a research perspective, I believe the careful documentation and evaluation of the development and scale-up of the NMC will serve as a guide for other nutrition initiatives aiming to generate networks and scale-up. 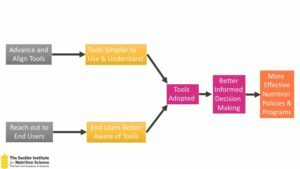 As a field, we are still learning about the uptake and adoption of our recommendations and tools from the individual level (e.g. adherence to dietary or supplement recommendations) to the national and global level (e.g. implementing the International Code of Marketing of Breastmilk Substitutes or a national fortification program). 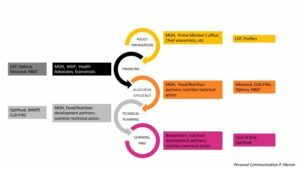 Thus, I think the NMC that, among other objectives, aims to make a set of tools accessible to stakeholders, can provide insights to the IS community through the analysis of the proposed impact pathway. We thank Kassandra Harding, Associate Research Scientist, Yale School of Public Health for her thoughtful contribution to this blog. To learn more about upcoming events visit our events listing page here.